Although a timber framed structure is often compared to a fine piece of furniture, the finishing requirements and objectives for heavy timbers and quality furniture are quite different. The finish itself should be different as well. Varnishes, lacquers, and urethanes work well on kiln-dried, dimensionally stable furniture-grade lumber, but these same finishes would be impractical on timbers, whose fibers and cells must "breathe" and move, due to varying moisture content and stresses within the wood. Green timbers seek moisture equilibrium, and the escape of moisture along with the chemistry of green wood will break down or oxidize a finish that seals the wood completely. With re-sawn material the same factors occur in reverse: the dry fibers need moisture and suppleness from the finishing oils to reduce further checking and brittleness, as new stresses and movement from re-sawing and re-joining come into play. For either green or re-cycled material, there are three goals in the finishing process. 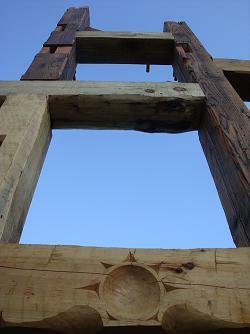 The first is to reduce the checking, drying, and shrinking process in both the timbers and joinery. The second is to enhance the beauty of the particular species of wood that is used. At the same time, the finish must be easy to apply, and simple to maintain and re-finish over the years. Last, but certainly not least, the finish should be relatively safe to both the users and the environment. Most commercially available finishes cannot adequately accomplish all of these objectives for several reasons. Nearly all of these finishes contain metallic driers which speed up the drying time of the finish, necessitating the application of many thin coats that only serve to seal the surface of the timber. The wood simply cannot stay wet long enough to allow the oils to be absorbed into the cells, fibers, and checks of the timber. These driers, although used in small quantities, are quite toxic. Also, most available finishes are 70-80% solvent, leaving very little protective material on or in the timber. Re-application only serves to seal the timber further because of the rapid polymerization due to the driers. And the higher the solvent ratio, the higher the VOC (volatile organic content) level in the shop. Some (but not all) finishes out-gas aldehydes as they dry, although water-based finishes are much safer in this respect. Typically, touch-up work, reapplication, and periodic maintenance is a time-consuming process. A good finish for timbers must be drier-free in order to allow time for penetration and absorption, and to prevent rapid breakdown of a finish that merely seals the surface. (On timbers, finishes that seal the surface only are more prone to UV degradation, as well to oxidation for the previously mentioned reasons.) Without driers in the finish, if properly applied, the finish will definitely reduce checking and shrinking, even in green oak. Secondly, a good finish for timbers must be able to be easily and rapidly applied due to the large surface area of the frame. The excess should be easy to wipe off without leaving lap marks and a gummy build-up on the surface. The optimum solvent-to-solids (oils, waxes, resins) ratio is about 50/50. The ingredients should be the purest grades in order to discolor as little as possible over time. Such a finish is flexible, "living" in and not on the timber, and is easily replenished through the years as needed without a lot of surface preparation. I recommend application of one good heavy coat, filling all surface checks and coating all joinery, prior to raising; and touch-up and cleaning after drying in the frame, using more finish and a rough pad where necessary to remove scuffs and abrasions, dirt, dust, and paint, and of course, the inevitable footprints. Over the years, as the timbers appear dry and "thirsty," more finish can be applied as needed to keep the timbers in the best possible condition for generations to come. Article by R. Michael Baugh, founder of Land Ark Finishes, Land Ark Inc., Copper Hill, Virginia. Photo credit: Beautiful hand cut timber frame and photo by Aaron Larson, La Farge, WI. Used with permission.